This study analyses the impact of knowledge assets on productivity and technical efficiency in the EU, as well as their role in the process of knowledge transfer. The analysis covers the role of the institutional and regulatory environment in affecting productivity and technical efficiency and how different regulations interact with both the accumulation of knowledge assets and the transfer of technology. Special emphasis is put on the analysis of trends and performance within the EU, across countries and sectors. The trends and performance of the EU at aggregate and sectoral levels are also contrasted with those of other major competitors, such as the United States, Japan or Korea. 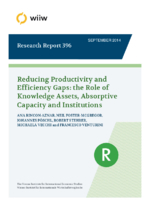 Further, the effects of the recent crisis on productivity and efficiency at firm level are explored.